On Saturday, June 16, 2018 a tour came through Atlanta, Georgia that made the Masquerade go absolutely wild. Hockey Dad, Cold Fronts, and Mt. Eddy are currently on a full U.S. tour together and this trio is a force to be reckoned with. Though they all come from vastly different areas of the world, they each come with the same indie, punk rock vibe. Mt. Eddy opened the show with a bang, blasting through several hits off their 2017 album Chroma. Mt. Eddy, formerly knows as Jakob Danger , is punk rock band from Oakland, California led by singer and guitarist Jakob Armstrong with Chris Malaspina on drums, Enzo Malaspina on guitar, and Kevin Judd on bass. They pull from influences in California punk and indie rock, which is apparent in their surfer rock vibes that dive straight into a power chord pulsing chorus ; or maybe even a lick or two of some smooth, sweet jazz. When Enzo took the stage with a huge cowboy hat on, that we later found out belonged to Cold Fronts, everyone knew we were about to have a great time. Mt. Eddy may only currently have one album out, but they have released some singles in 2018 such as I Luv Robert Smith and Zombie. We hope to get hear more from Mt. Eddy very soon and hopefully new music will be followed up by a headlining tour. Cold Fronts took the stage next and their energy brought the whole room together. Cold Fronts are an indie rock band from Philadelphia, Pennsylvania. The band is led by Craig Almquist with Max Steen on guitar, Alex Luquet on Bass and Joe Killian on drums. When the band took the stage, the crowd went nuts for Craig as he ripped through several of their hit songs on guitar, jumping around the stage adorning his almost cartoonish, large cow boy hat. The band is currently promoting their brand new album Fantasy Du Jour on the tour and they touched on a few tracks of the album like Stayin’ In , Let the Record Play, and Aftermath. About half way through the set, Craig hoped off stage and took off around the dance-floor, making his way up onto the bar and dancing his way all the way back on stage. Their set was nothing less than a house party from start to finish and their energy definitely caught out attention. We hope to see the Cold Fronts in Atlanta again very soon. 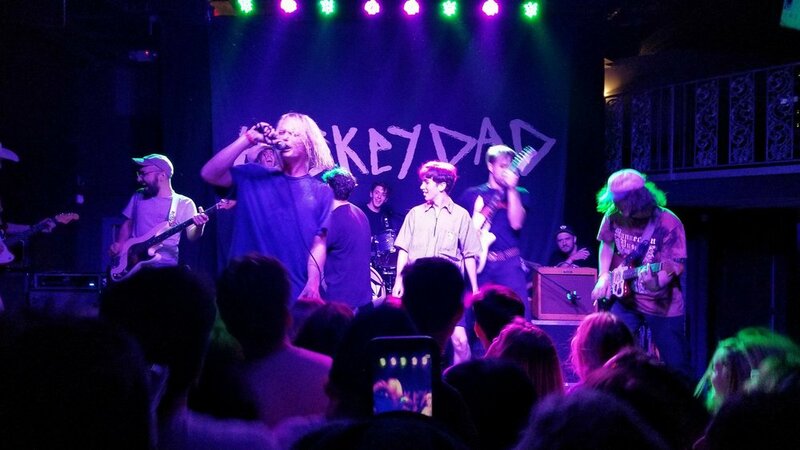 Hockey Dad headlined the show with a totally indie rock vibe that would explode into a full on raging, punk rock mosh pit. Though Hockey Dad makes their way to the stage with only two members, Billy Fleming and Zach Stephenson, they have a huge sound that commands a room with the first stroke of a guitar pick. The band comes straight out of Australia with their surf rock, indie vibes and their main influence is ’60s garage rock. They are currently promoting their new album Blend Inn, which they recorded directly after their successful run with their first album in 2016 known as Boronia. During their set they touched on hit singles from both of their albums, while members of Mt. Eddy periodically infiltrated the mosh pit to dance with fans. Towards the end of their set, they invited both opening acts Mt. Eddy and Cold Fronts on stage to have a super group jam for one song while they all took turns crowd surfing. The energy during their set was indescribable and was definitely a moment that will go down in Masquerade history. All three acts are definitely making quick strides to the top in the world of indie, punk rock music. They are three names that we see becoming main stream, house-hold names in the near future. For tickets and more information about the current tour, check out Hockey Dad and their website.